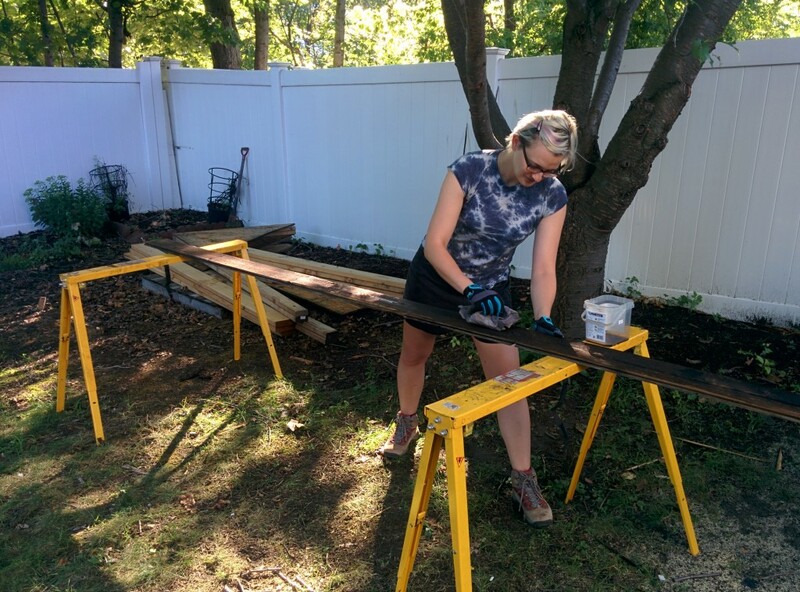 One early decision we made was not to use the typical shingled cedar siding that most tiny houses employ. Instead I wanted the siding to be smooth by using shiplapped or tongue and groove siding. We also decided to get reclaimed wood for our siding, which is a very hip thing to do but darn if it doesn’t look fantastic. 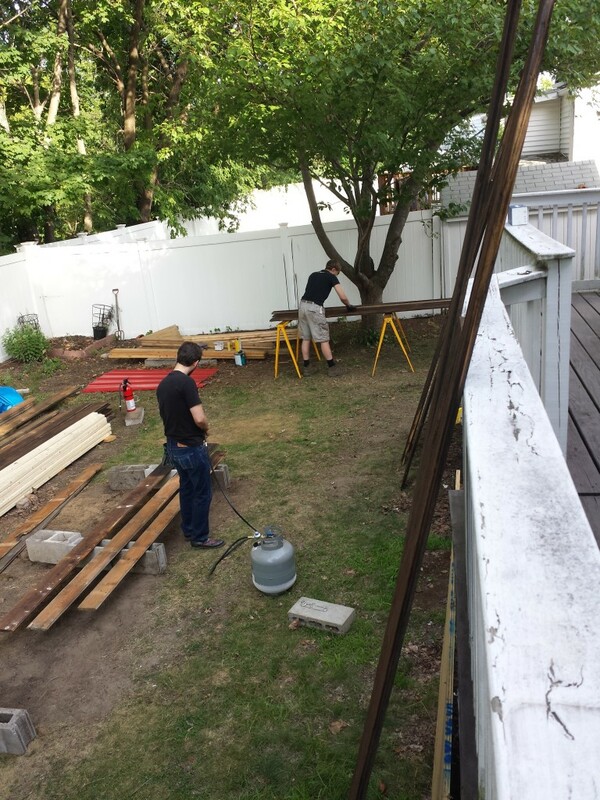 We were unable to find affordable1 reclaimed boards that could be used for exterior siding without treatment, so we decided to save some money and spend the time to treat them. In our case we are also applying a special exterior-grade oil on the wood to further protect it from the elements and insects. Although it’s expensive, our speciality hardware store said it’s the right stuff for the job. After a little practice the treatment process was fairly straightforward. First, friend of the house David put his knowledge of flame management to work and did the actual singeing, achieving a very lovely even finish. The boards, being reclaimed, responded very individually to the flame. Some singed easily, others really didn’t want to blacken. Although you can’t see the flame, the heat coming out of the torch was intense. Occasionally the dry grass would catch fire and we’d stamp it out. We also had a fire extinguisher nearby in case it got out of hand. Next, I took a stiff steel brush to the boards and removed the loose soot. You can see this more easily in the youtube video above. 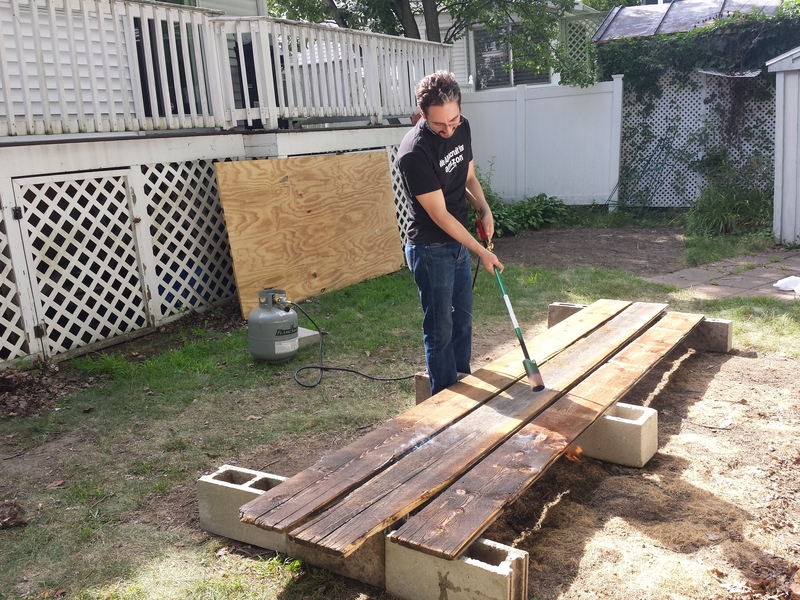 Lastly, Char applied the oil to the boards. 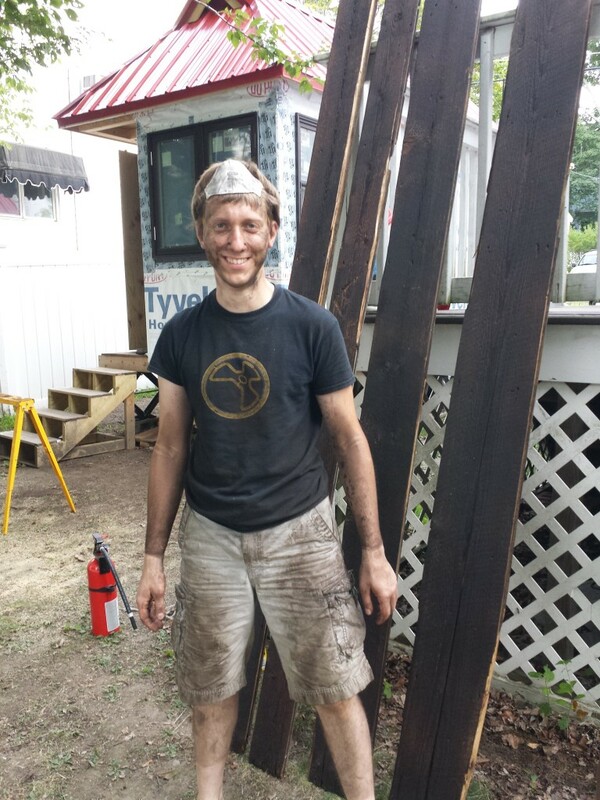 The final result is some very nice blackened boards, and a man absolutely covered in soot. Good luck will rub off when I shakes 'ands with you.